I saw Fantastic Beasts and Where to Find Them this weekend with trepidation and muddled expectations. I did not expect to leave the theatre euphoric and beaming, with the eternal love that I hold in my heart for the magical universe penned by the transcendent J.K. Rowling, stronger than ever. I picked up the first Harry Potter book when I was nine years old. I read it totally unaware of what the stories entailed, completely oblivious to the overall impact it would inevitably have on my life. Delving into the Harry Potter series was one of the most enjoyable and simplest things that I’ve ever done. I inhaled the books one by one, absorbing their magic like a sponge and wishing with an aching soul that I could somehow go to Hogwarts, too. I eagerly awaited each new movie and I perched by my front door all day, anxiously waiting for my pre-order of the last book. 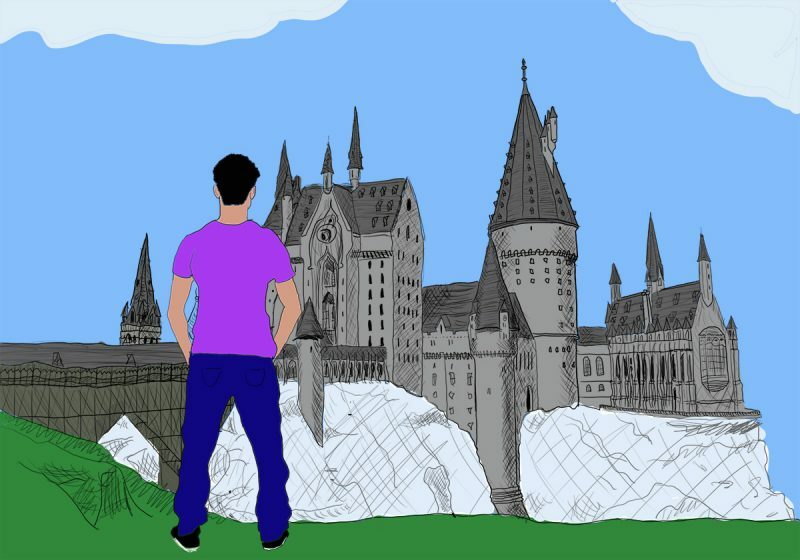 I was enraptured with the entire magical world that Rowling created, an excitable young fan brimming with adoration for a series that had affected me so greatly. Harry Potter was never a mere book series to me; it was the source that sparked my love of reading and my eventual desire to write. The books gave me characters that felt so tangible and entirely relatable, that I cared for them as though they were my own. Hermione epitomized everything that I was, I am and who I strived to be. She’s an exemplification of strength, intelligence and independent womanhood who bravely grasped her flaws with pride. As a little girl who once felt embarrassed to reach out of her seat to answer a question or read a book during recess, Hermione gave me a familiar comfort that I didn’t know I needed. For years, up until the release of Deathly Hallows Part Two, I had always had some form of Harry Potter to look forward to. Something enchanting was always on the horizon, waiting for me. When Pottermore was announced, I leapt on the opportunity to find my Hogwarts house. I cried with happiness when I was told that I was a Slytherin. I was able to interact with a likeminded group of people who were equally as passionate about a fictional world that held so much power and meaning to them, as it did for me. The last movie felt like my final step onto Platform 9 and 3/4, but I always hoped that there would be more in store. It’s strange though, when Harry Potter and the Cursed Child was announced, released and now sitting (unread) on my bookshelf, I couldn’t bring myself to open it. I don’t want to know anything else about my beloved characters, my ragtag assortment that I consider my own close friends. I have my own firm ideas of where I wanted them to go and who I wanted them to be. I don’t want those expectations dashed away to something less-than. I want to look at it with blissful ignorance. Yet, when Fantastic Beasts and Where to Find Them was introduced, I was more willing to accept it. This film was a new chapter: a new addition to a realm that mattered most to me. I believe that is where the success of it was tied to, in making itself separate from Harry Potter overall, but keeping its familiar warmth. When the title appeared onscreen, accompanied by the welcoming, friendly notes of the series’ theme, I became tearful, knowing that I was back home, once again. These books and their vast, beautiful universe aren’t just items of fiction to me. They are the pieces that completed my personal puzzle. They make me feel safe, make me laugh, cry and value the true worth that books hold. For those reasons, along with countless others, the fantastical wizardry of J.K. Rowling’s creation will be something that I cherish for the rest of my life.